Priced: $86.99 - $128.90 Rated: - 5 stars out of 5 by 6 reviews. Prana Barclay Sweater - Welcoming the weather, the Men's Barclay Sweater from prAna offers a wool blend knit, with fleece-lined collar and cuffs that feels bare skin against the elements. The Barclay features a two-way zipper and convenient inner iPod sleeve. Collar and cuffs are fleece lined for extra warmth. 44% wool, 40% polyester, 14% nylon, 2% other fibers. Wool blend helps insulate and wick moisture from your body. Contrast stitching gives a real outdoors feel. Inner MP3 player sleeve helps you take your tunes with you. Wool blend sweater knit with brushed polyester backing. The wool-blend Barclay Sweater has a brushed-poly lining and a fleece collar, plus a media pocket to keep your tech protected too. 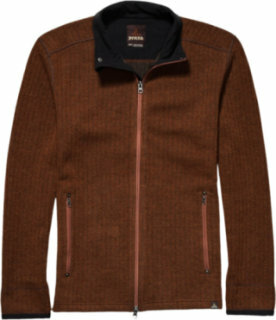 Zip up in you prAna Barclay Sweater when the sun sets and the campfire is warming up. Blended wool serves up cozy warmth while the the synthetic fibers help move moisture away from your skin. Plus, the zippered pockets mean your keys won't fall out on the ground when you lay back to check out the stars. PrAna's Barclay Sweater isn't a barrier to weather - it simply welcomes it. The wool blend knit, with fleece-lined collar and cuffs, feels good against bare skin. Features a two-way zipper and inner media pocket. Welcome the cooler months of the year with this simply warm sweater. 15 people have already set their own price. The inside of this sweater is flocked with a downy soft layer so it's super soft and not at all scratchy (I hate scratchy sweaters). I don't know how it will stand up to washing but I'm willing to pamper this garment because it's an absolute joy to wear and it looks great. The collar and cuffs lined with fine fleece and are also extremely soft. It's like it's made of kittens! If they made an extra small I would get one for my wife. It's a slim fit and will fit comfortably under a light jacket -- great for layering. I liked this sweater the minute I saw it! So much so, I ordered both the olive and charcoal colored versions. I love the styling and just-right fit these sweaters provide. The only small issue I had was with the zipper; it can be a trifle temperamental at first, but after working with it, I was able to zip it up without further problems. Overall, these sweaters are great!! I love this sweater! I bought this sweater in both desert and charcoal. The inside is very soft and they look sleek casual. I'm not sure if it was just the one I got but the desert seemed to run a bit bigger than the charcoal but I ended up keeping it anyway. I bought this sweater for my husband who is athletically built and usually wears a Men's Medium. The Med fit perfectly. It has a more narrow cut which is very attractive. He loves it and it looks great on him. Great quality, great choice! Very comfortable, tight-fitting sweater. Fleece on inside is very soft. Only thing is zipper is plastic and a little temperamental. Otherwise, very happy with this and would buy another in another color. Great full zip sweater. After I got one for myself I got them for gifts for my family. The fleece in the cuff and collar is nice.